Postpartum Depression from Tracey F.
Having a baby is typically described as a time of joy. A time to celebrate the new little life that has been brought into this world. A time to be thankful for the family unit that has now been increased by one or more. However, for some women, this life-altering event brings about feelings that aren’t quite as joyful, and begins a condition known as postpartum depression (PPD). The National Institute of Mental Health (NIMH) defines PPD as a mood disorder that sometimes appears in women after giving birth. Additionally, they say that this disorder typically comes feelings of “extreme sadness, anxiety, and exhaustion,” sometimes to the point where everyday activities are difficult to complete. According to the American Psychological Association (APA), as many as one in seven women suffer from PPD, a condition that can present itself anywhere from a few days up to several months post-delivery. It has no boundaries, either, because it can affect any new mother without regard to her background, ethnicity, socioeconomic status, or whether it is her first time or fifth time giving birth. It’s important to note that feelings of sadness and anxiety directly after childbirth can occur without rising to the level of PPD. These are typically referred to as “postpartum blues.” So, what’s the difference? One of the main differences is that the postpartum blues condition typically appears within 2-3 days of childbirth and disappears within a week or two, according to the American College of Obstetricians and Gynecologists (ACOG). This is different than PPD, which generally sets in anywhere from one to three weeks post-birth but can take up to one full year before it presents itself. 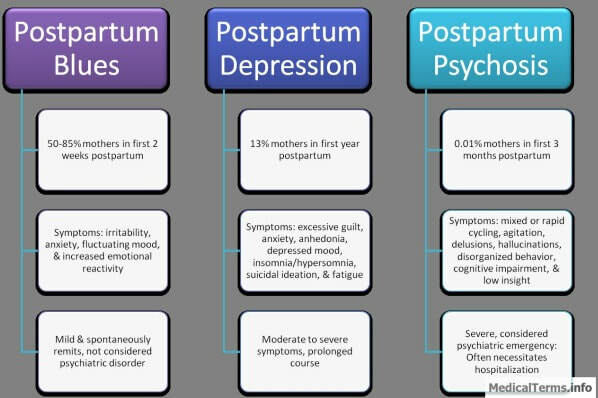 Also, PPD often requires some type of intervention to begin to resolve, while postpartum blues generally disappears on its own. Additionally, the feelings associated with postpartum blues—sadness, anxiety, and being upset with the baby or a loved one—are usually much less intense than the feelings associated with PPD. With the latter, the new mother’s emotions are typically fairly intense, possibly even reaching the point where they become totally debilitating.